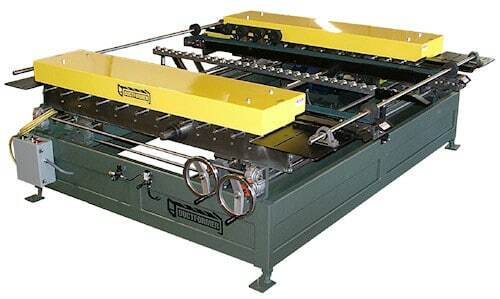 The Dual Head Rollformer is designed to form two (2) edges of the strip or part at the same time in a single pass thru operation. The Dual Head Rollformer provides a Quick Changeover concept for parts requiring a wide range of widths. It can be used as a free standing blank fed unit or adapted into a coil feed application. A Dual Head is primarily used on edge forming operations requiring straight parallel formed edges like shelving, cabinets, and wall panels. The Rollformer consists of two (2) parallel Rollform head assemblies (spindle housings) mounted on a common frame and drive with opposed Roll tooling mounted on outboard extended spindles. The one Rollform head is usually fixed and the other is movable. Width variation can range from approximately 6″ to 60″ with special applications as wide as 120″. Not all Rollform companies can build a quality Dual Head Rollformer. We have over 40 years of design and application experience to build a high quality machine. The movable head is usually mounted on slides with leadscrews to hold the heads parallel across the full width range. As in all Rollform applications the part perimeters will determine the size, centers, spindles, and horsepower required. With a Dual Head not only is the quality of the spindle housings (forming heads) important but also the alignment and parallelism of the heads and how the slide and drives are configured. Optional Applications: Our Dual Heads are designed with additional inboard roll space which could be tooled with additional Rollform profiles. When multiple changes are required within the Dual Head edge form profiles, we offer a wide variety of Quick Changeover applications.